Kevin Hoadley has over 30 years of auto body and collision repair experience. After completing the Auto Body Repair program at the Area Vocational Center in 1977, Kevin went on to begin his career in the auto body industry serving the Decatur/Forsyth area with his expertise. 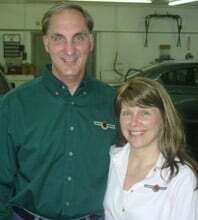 He worked for a local car dealership as an auto body repairman and then spent 25 years working for one of Decatur's largest auto body repair shops before taking ownership of Garner-Hoadley Auto Body in August, 2009.
satisfaction in auto body and collision repair.